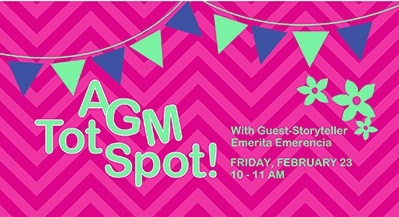 Bring your little ones to the next AGM Tot Spot! We will be joined by Guest-Storyteller Bernice Hune! The AGM recommends 1 parent for every 2 children attending AGM Tot Spot. Bernice Hune spins gold mountain stories, telling traditional folktales from Asia entwined with Canada's immigrant history stories. She is a storyteller, actor, radio broadcaster and arts educator who grew up in Toronto immersed in Cantonese songs and stories - elders sharing traditional folk tales, as well as personal stories about the railway, the head tax, and the struggle for the rights of full citizenship. She is an animated workshop leader and guest speaker and has presented in daycares, hospitals, senior residences and inter-generational community centres.